The following is one of many articles produced by the International Consortium of Investigative Journalists (ICIJ) and Süddeutsche Zeitung, the largest German national subscription daily newspaper. Approximately 400 journalists from more than 100 media organizations in over 80 countries have taken part in researching the documents. The ICIJ Offshore Leaks project is one of the largest collaborations in journalism history. At the end of this article are excerpts concerning The Panama Papers–The Secrets of Dirty Money. The files of Mossack Fonseca reveal all kinds of connections to the activities of the world’s intelligence agencies. For instance, there are links to the Iran-Contra affair, a scandal that involved secret arms shipments under President Ronald Reagan. Oliver North, a military advisor, was charged at the time. Adnan Khashoggi, an arms dealer, also appears in the documents in this context.On July 4, 1986, a four-engine Boeing 707 landed in Tehran, the Iranian capital. It had taken off in Rijeka, Yugoslavia, fully loaded with valuable goods from the United States. Seven years after the Islamic Revolution, the Iranian regime was suffering from the sanctions the US had imposed. The airplane was thus delivering military equipment that was in short supply, including defense missiles and replacement parts for fighter jets–all of which were subjected to the embargo.The delivery was a typical undercover operation: officially, Iran and the United States were archenemies. And yet the military supplies aboard the Boeing were American. The Central Intelligence Agency (CIA) orchestrated the delivery in exchange for the release of American hostages in Lebanon. Iran was to arrange the release, in addition to paying for the arms. The CIA would then use the funds to finance the uprising of the Contra rebels in Nicaragua. The Iran-Contra affair was only exposed later on. Oliver North, who worked for the National Security Council (NSC) at the White House, was one of several people who had to testify at a congressional hearing. Initially, the operation was meant to remain secret, which explains why the Reagan administration couldn’t make the military delivery with the US Air Force. The Reagan administration needed what intelligence agencies often require to carry out their secret transactions: intermediaries, middlemen, companies, and airplanes that don’t look like they’re owned by the US government. In other words, the government needed what intelligence experts refer to as “plausible deniability”, which essentially means the ability to deny things in a credible manner after the fact. The Panama Papers now provide new insights into the business dealings of Azima and half a dozen other personalities suspected of having links to intelligence agencies for decades. Many are thought to have helped the CIA, even though they have consistently denied it. While no direct CIA payments have been found in the files of the Panamanian law firm Mossack Fonseca, the documents do show a number of behavioral patterns that are well known in secret agent circles: dubious company structures, business transactions with used airplanes, and partnerships between shady characters. The Mossack Fonseca files leaked to Süddeutsche Zeitung, which were analyzed in cooperation with the ICIJ, contain a number of names from the world of espionage: two suspects from the Iran-Contra affair, a suspected CIA helper for arms deliveries to Afghanistan, and high-ranking former officers of the secret services of Saudi Arabia, Colombia, and Rwanda. The documents reveal that Mossack Fonseca’s clients included Saudi Arabia’s first intelligence chief, who was named by a U.S. Senate committee as the CIA’s “principal liaison for the entire Middle East from the mid-1960s through 1979.” Sheikh Kamal Adham controlled offshore companies later involved in [BCCI,] a U.S. banking scandal; Colombia’s former chief of air intelligence, ret. Maj. Gen. Ricardo Rubianogroot, held shares in an aviation and logistics company; and Brig. Gen. Emmanuel Ndahiro was a doctor turned spy chief to Rwanda’s President Paul Kagame. Adham died in 1999. Ndahiro did not respond to requests for comment. Rubianogroot confirmed to ICIJ partner and Colombian investigative journalism organization, Consejo de Redacción, that he was a small shareholder in West Tech Panama, which was created to buy an American avionics company. The company is in liquidation. The Greek entrepreneur Sokratis Kokkalis, once known to the Stasi as “Agent Rocco”, is also mentioned. And of course, the German secret agent Werner Mauss also appears. Mauss operated or still operates a dozen shell companies via Mossack Fonseca. It is striking just how comfortably these professionals use shell companies to carry out covert operations–in some instances, even long after their retirement. Indeed, it seems that old habits die hard. The documents show that Mossack Fonseca’s offshore structures not only served the interests of suspected tax evaders and other criminals, they also supported spies in a business that relies on absolute secrecy. The phenomenon can easily be explained. “You can’t exactly walk around saying that you’re a spy,” says Loch K. Johnson, a professor at the University of Georgia, in explaining the cover that offshore firms offer. Johnson, a former aide to a U.S. Senate committee’s intelligence inquiries, has spent decades studying CIA front companies. Just like everyone else, spies, hostage rescuers, or weapons smugglers need logistics, starting with things as simple as bank accounts and credit cards to pay for their hotel rooms. Sometimes they also need cash, a ship, or even an airplane. It is in these instances that a front company can conceal the true customers or interested parties. Ian Fleming knew this, too: in his James Bond novels, “Universal Exports” was often used as a company name to cover up the British secret agent’s activities. It is very telling that the company has such a nondescript name. Whenever Bond has to make a call to London, he identifies himself as a businessman who is contacting his boss at the export company. He then talks about trivial things, the true meaning of which only British intelligence understands. Over the years, “Universal Exports“ has become the epitome of secret service front companies. In fact, the name is so well-known that Mossack Fonseca’s business partners still mention it today. When a trustee wrote to the Panamanian law firm in 2010 to request that a company be set up for a client, he joked about possible company names: “I’ll suggest a name like ‘World Insurance Services Limited’ or maybe ‘Universal Exports’ after the company used in the early James Bond stories but I don’t know if we’d get away with that!” Many of the company names that appear on Mossack Fonseca’s lists suggest that the parties concerned would at least like to have the feeling that they’re close to the world of espionage. Company names include “Goldfinger”, “Skyfall”, “Moonraker”, “Spectre”, and “Blofeld”–all of them well-known from Bond movies. Evidently, the clients of the offshore business either have a good sense of humor, or are just plain cynical. The trail to the world of espionage not only leads to secret agent movies, but also to the real world of intelligence agencies. One example is Loftur Johannesson, a wealthy 85-year-old Icelander from Reykjavík. 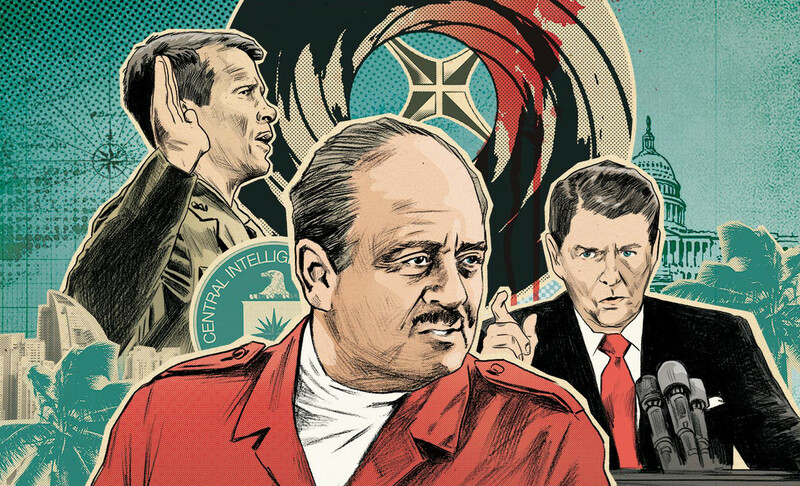 Several articles and books have shown links between Johannesson and the CIA. Among other things, he is thought to have supplied weapons to anti-Communist rebels in Afghanistan, an allegation that Johannesson has denied. “Mr. Johannesson has been an international businessman, mainly in aviation related activities, and he completely rejects your suggestions that he may have worked for any secret intelligence agencies,” a spokesman told ICIJ. From 2002 onward, his name appears in connection with at least four companies that Mossack Fonseca manages, and which are headquartered either in the British Virgin Islands or Panama. It is not clear why people like Johannesson still need offshore companies after they have retired, or why they may keep a portion of their assets there. It is likely difficult to transfer revenues from secret business activities to a normal account without raising suspicion. The German secret agent Werner Mauss’s shell companies raise similar questions. Does he (or did he) need them to move ransom money, collect commissions, or simply to save taxes? According to information provided to the Süddeutsche Zeitung, the state prosecutor’s office in Bochum, Germany, is currently investigating Mauss on suspicion of tax evasion. Mauss, however, has expressly denied the allegations. Operating fleets of airplanes (or managing global trade activities with them) appears to be one of the business sectors to which intelligence agencies or their suspected helpers are often linked. For instance, Farhad Azima, the Iranian in exile, whose Boeing 707 allegedly flew weapons to Tehran, appears in the Mossack Fonseca files from 2000 onward. At the time, he had a shell company called ALG (Asia & Pacific) registered in the British Virgin Islands. It appeared to be a branch of his Aviation Leasing Group, a US company based in Missouri that operates more than 60 aircraft. It wasn’t until 13 years later that Mossack Fonseca realized it might be dealing with a man who did business with an intelligence agency. At the time, Mossfon employees came across a report that linked Azima to the CIA. The report described how a company called EATSCO (Egyptian American Transport and Services Corporation) was thought to have helped deliver weapons to Libya in the late 1970s. The company was owned by several former CIA agents. When they found out about this, Mossack Fonseca became nervous, and asked an Azima representative to confirm his identity. When the law firm did not receive an answer, it looks as though it didn’t pursue the matter any further. Perhaps Mossfon determined that it was best not to know the details in some instances. Mossack Fonseca responded to a request for comment by explaining that it does a thorough background check on each of its clients. However, the law firm declined to comment on specific cases, stating that it finds any abuse of its services unfortunate. Azima is linked to another dubious person: as the Mossack Fonseca documents show, in November 2011 Azima was registered as the co-director of a company named Eurasia Aviation Holdings Limited. Once again, the company appears to deal in airplanes. Houshang Hosseinpour (who is also active in the aviation business) is named as another of the company’s co-directors. Later on, the US government accused Hosseinpour of violating US sanctions imposed on Iran. And in February 2012, Eurasia Aviation suddenly claimed that Hosseinpour had nothing to do with the company, and that his name had appeared as a result of an “administrative error”. Shortly after, the company purchased an airplane. In itself, none of this demonstrates any contact to the CIA. However, it does show how comfortably people in intelligence circles move about in the world of shell companies. Adnan Khashoggi is another example of this: the Saudi billionaire is said to have orchestrated arms sales to Saudi Arabia in the 1970s. According to a US Senate report [The BCCI Affair: Bank of Credit and Commerce International Senate Investigation Report December 1992; Section 11, BCCI, The CIA and Foreign Intelligence; HTML and PDF formats], he also played a “central role” [“Similarly, Khashoggi and Ghorbanifar performed a central role for the U.S. government in connection with the Iran/Contra affair in operations that involved the direct participation of CIA personnel.” page 308] in helping the CIA make secret arms sales to Iran. Khashoggi also appears in Mossack Fonseca documents: from 1978 onward, he is listed as head of Isis Overseas S.A., a Panamanian company. The documents also link Khashoggi to four other companies, which he used mainly between the 1980s and the early 2000s. It is unclear what these companies were meant to hide. At any event, the files confirm suspicions that secret agents, weapons dealers, and hostage rescuers need a secret financial infrastructure in addition to the services of companies like Mossack Fonseca, from which they don’t expect too many questions. There is no indication that Mossack Fonseca looked into Khashoggi’s past, even though the firm processed payments from the Adnan Khashoggi Group the same year he made global news when the U.S. charged him with helping Ferdinand Marcos, president of the Philippines at the time, loot millions. Khashoggi was later cleared. Mossack Fonseca’s files show the firm ceased business with Khashoggi around 2003. It goes without saying that the shell companies of intelligence agencies are not located only in tax havens. Supposed private companies that in fact work for the CIA can also be established in the United States. One recent example is a network of six US companies, among them Aero Contractors Limited, Pegasus Technologies, or Tepper Aviation. While these companies are listed as providers of chartered flights, after 2001 they operated 26 airplanes that in reality belonged to the CIA. At the time, the Agency used the airplanes for the global war on terror, for instance to move suspected Al-Qaida terrorists between secret prisons and other torture facilities. Just as was the case for arms shipments to Iran, prisoner transport was not something that the government could do openly. The New York Times, which exposed the true activities of Aero Contractors and others, cited a former CIA agent as saying: “When the C.I.A. is given a task, it’s usually because national policy makers don’t want ‘U.S. government’ written all over it“. By all appearances, shell companies and tax havens have helped people in the underworld lead a double life. For instance, Farhad Azima, the Iranian-born airline executive, is thought to have been involved in several dubious arms deals. However, nothing has ever been proven, and Azima can still present himself as a high-society businessman in his other life. He is also a well-known donor to US politicians. Azima has donated money to both Republicans and Democrats. Former President Bill Clinton invited him to the White House on several occasions, and Azima has also supported Hillary Clinton’s campaign. In September 1996, ten years after the Iran-Contra affair, Bill Clinton was seen at a hotel in Kansas City during his presidential campaign, where he led the chorus of people singing “Happy Birthday” to their host–none other than Farhad Azima. Azima had pledged to donate USD 250,000 to Clinton’s campaign. About the Panama Papers: The scale of this information leak is unprecedented: 2.6 terrabytes of data, 11.5 million documents, 214,000 letterbox companies. The Panama Papers include approximately 11.5 million documents–more than the combined total of the Wikileaks Cablegate, Offshore Leaks, Lux Leaks, and Swiss Leaks. The data primarily comprises e-mails, pdf files, photo files, and excerpts of an internal Mossack Fonseca database. It covers a period spanning from the 1970s to the spring of 2016. The leaked data is structured as follows: Mossack Fonseca created a folder for each shell firm. Each folder contains e-mails, contracts, transcripts, and scanned documents. In some instances, there are several thousand pages of documentation. The company at the center of all these stories is Mossack Fonseca, a Panamanian provider of offshore companies with dozens of offices all over the world. It sells its shell firms in cities such as Zurich, London, and Hong Kong–in some instances at bargain prices. Clients can buy an anonymous company for as little as USD 1,000. However, at this price it is just an empty shell. For an extra fee, Mossack Fonseca provides a sham director and, if desired, conceals the company’s true shareholder. The result is an offshore company whose true purpose and ownership structure is indecipherable from the outside. Mossack Fonseca has founded, sold, and managed thousands of companies. The documents provide a detailed view of how Mossack Fonseca routinely accepts to engage in business activities that potentially violate sanctions, in addition to aiding and abetting tax evasion and money laundering. About Süddeutsche Zeitung (SZ) Headquartered in Munich, is one of Germany’s leading newspapers. SZ has a total readership of 4.4 million for its print and online media. Its investigative journalism team counts five people, three of which are members of the International Consortium of Investigative Journalists (ICIJ). The Süddeutsche Zeitung has won a number of prestigious awards for its research work. Its team has cooperated with other media organizations on a number of projects, including Offshore Leaks, Swiss Leaks, and Lux Leaks, which ICIJ coordinated. At the beginning of 2015, an anonymous source began sending the Süddeutsche Zeitung data from Mossack Fonseca, a provider of offshore companies. This marked the beginning of the Panama Papers project. What needs to be revealed: One year ago “John Doe” sent a message. “John Doe’s” real name certainly is not John Doe. But this name, commonly used in the US by people who would like to uphold their anonymity, popped up. John asked a question that aroused our curiosity: “Interested in data? I would be happy to share.” And with that, one of the most unusual and exciting chapters in the history of Süddeutsche Zeitung (SZ) started. Often, those accounts are solely a cover-up for unlawful activities and shall protect criminals. SZ has evaluated data together with 400 journalists from all over the world during the past twelve months. Suddenly it becomes obvious how gigantic the problem of offshore businesses really is and how urgent it is for the world community to act upon it. So far it has commonly been known that rich people and companies use offshore firms to avoid–as they see it–annoying taxation as much as possible. This is already shameless often and violates the societal contract, because these taxes are desperately needed for national budgets. The missing money can’t be used for community purposes: the construction of schools, rail tracks and public housing. But the offshore problem goes far beyond that. Apparently terror groups are using this system to finance themselves, as SZ’s stories will show. Criminal regimes in Syria and elsewhere are presumably capable to bypass sanctions imposed by the international community and able to continue a war with barrel bombs against its own people. Members of China’s state and party leadership up to the entourage of the president himself apparently have set up an extraordinary amount of companies in or through Panama to hide millions of dollars abroad. Even before we published the results of our research, we received threats by those people who were confronted with our findings. The spokesperson of the Russian President Vladimir Putin prepared his people for an “information attack” of Western media. That was the Kremlin’s official answer to questions we had raised about those dubious transfers of huge amounts of money by the President’s entourage and about the fabulous wealth of close friends of Putin. The law firm in Panama running many of these business deals, announced retaliatory measures against coming publications. The use of “information/documentation unlawfully obtained” would be a crime. Many John Does are currently out there in the financial world. For media outlets the decisive question is not only if this information was obtained legitimately. There are two other crucial points: Is the source trustworthy? And is there a legitimate public interest? This interest is not a voyeuristic one. It must not be kept secret if a state–as in the case of Snowden–is gathering information about its citizens, continuously breaching law or the legal shell of friends and allies. On the same token it must not be kept a secret when the community of states–as in the case of the offshore business–does nothing or not enough if a criminal regimes breaches sanctions. This has to be revealed.